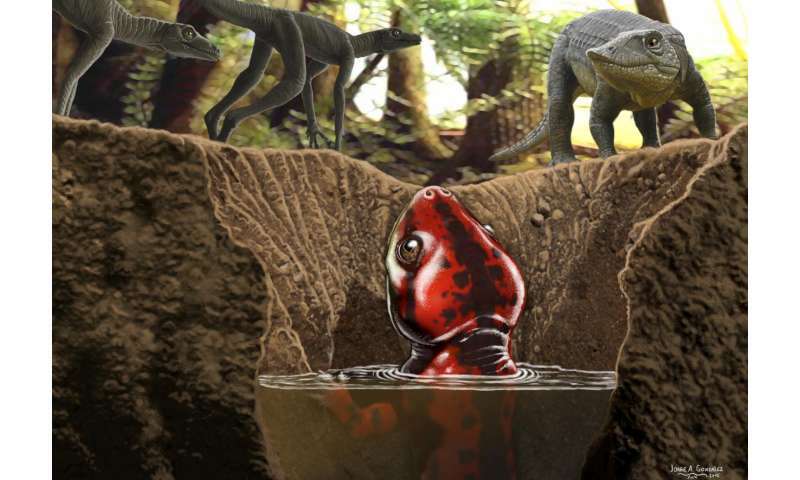 Before C. jenkinsi, scientists had found only two other caecilian fossils from the Age of Dinosaurs and—unlike the two recently unearthed—those came later and had reduced limbs, more closely resembling their contemporary living relatives. Evolutionists are always looking for this "missing link". Problem is, there are way to many of them. These "links" just plain don't exist in the fossil record. Occasionally yes there seems to be an "aha!" moment of the discovery of one of these missing links. But in order for evolution to be true,there have to be millions and billions of these missing links, as evolutionists claim that change happened slowly over millions of years. This is not what is observed in the fossil record. Bart this is not the fifties you need to get up to date. Start by reading a book about your religion. I'm not sure you are aware of the multitude of scrolls that have been found and deciphered over the last seventy years. Granted many were suppressed for fifty years, but with the Internet you have no excuse. Here is one of those suppressed books about some of those scrolls. Hopefully you will take the time to learn about it. I have my doubts since you choose to not understand the suppression of genes in chickens turning them back into dinosaurs kind of proves evolution. I will remain optimistic and full of hope this book brings understanding to your life. Good luck!